Crochet Hexagon Blanket is Finished! 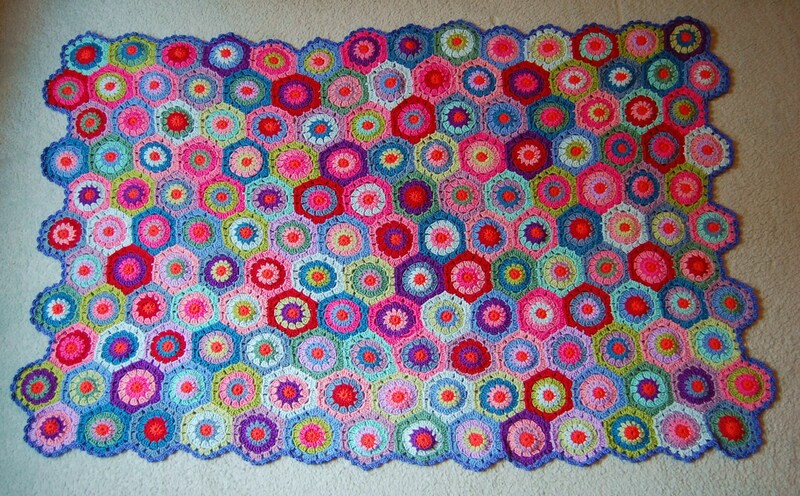 Since its inception on November 15, 2011, I knew this crocheted hexagon blanket was going to be breath-taking. With over 17 different colors combinations in a wonderful yarn, how could it not be? 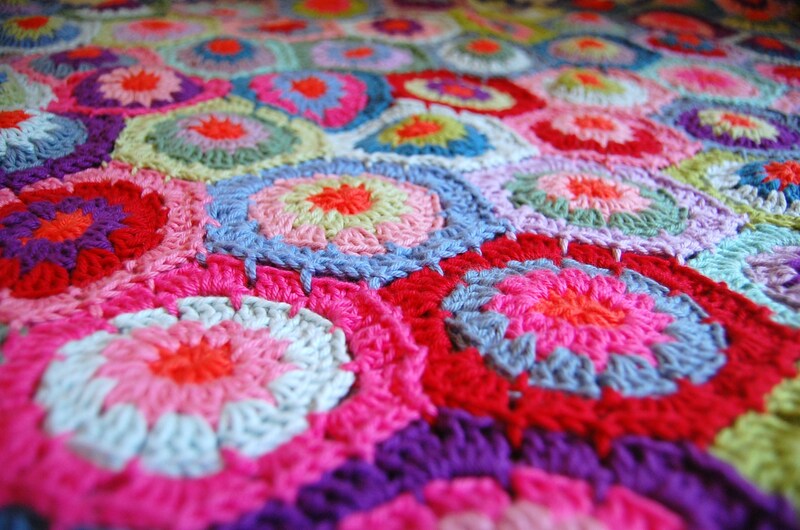 I knew this would be a one-of-a-kind crocheted afghan. Worth it factor (WIF): YES! I’d do it again in a heartbeat. As I was recently reminded, I said in one of my posts that, and I quote, “I don’t crochet afghans”. But with two crocheted afghans under my belt (this hexy one and another hexagon baby blanket), I’m starting to be converted to the world of crocheted afghans. Well, hexy is finished and I am so very proud of her. I mailed her off a few weeks ago to live at her new home. Thought saying goodbye was bittersweet, I’m overjoyed knowing she’ll be sharing her rainbow of joy with others for years to come. I wish you all could see the beauty of this blanket in person, but these pictures will have to do. Gorgeous! Well done. Love the color choices. 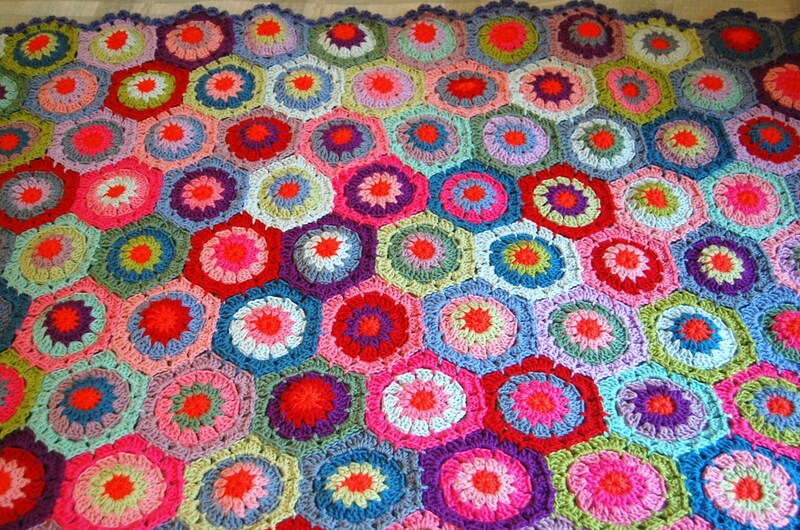 I’m always intimidated by afghans because I think joining all those little pieces will be a chore. Was it? I thought I’d have to join all 159 motifs together, but you join them as you crochet so you don’t have to sew them together. It made the project so much nicer! I don’t know if you can see it in the pictures, but each hexagon is connected to its neighbors at each chain-2 point in the last round. This connects the hexagons securely together without having to get out a sewing needle. I don’t think I would have been able to finish the project if I had to join each hexagon by hand! beautiful blanket & photos. 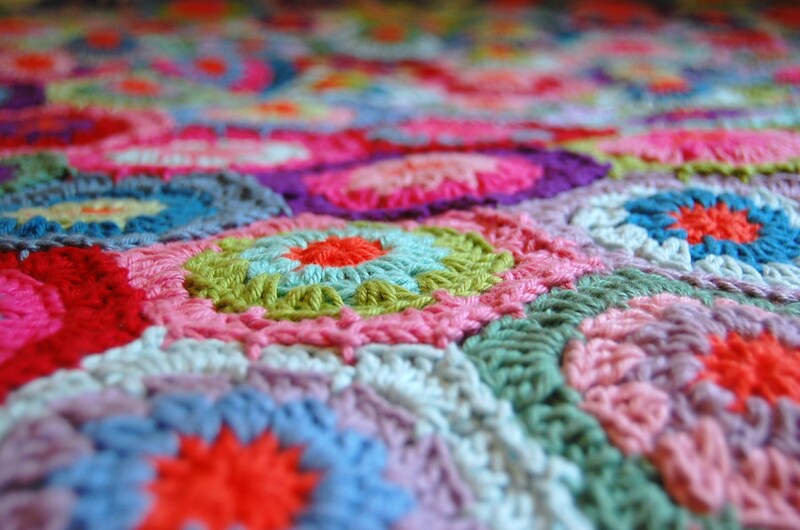 I love crocheting afghans, it’s still one of my favorite things to make. I love all of the colors, and the lucky giftee should love it forever! You should be proud of this blanket it is beautiful. Wow – it’s gorgeous – love the colours! Thanks you for sharing! Taking project on vacation, and so far it works very well on the road. I love color! Thanks again! The directions were great! Thank you everyone for the nice compliments. Many thanks goes out to Lucy from Attic 24 who provided the directions and original inspiration for the blanket. 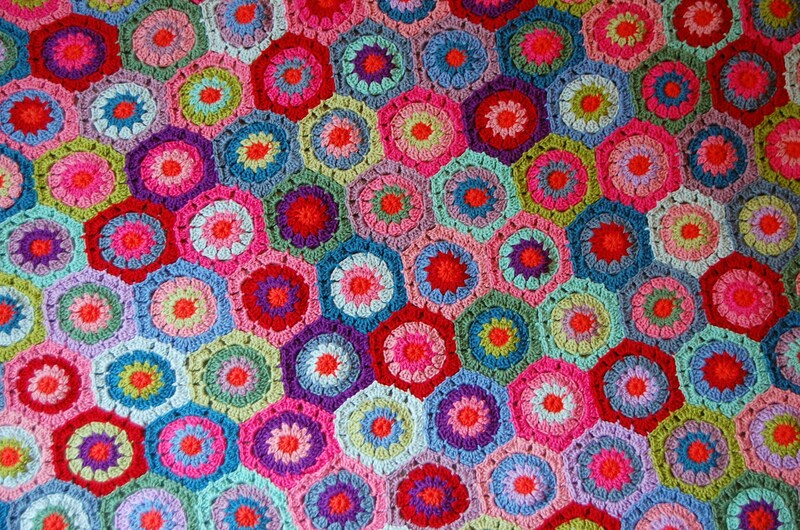 Glad to hear you’re enjoying the pattern, Sue M – the pattern can be quite addicting! How much yarn did it take, yardage-wise? I was wondering if you had any idea. I see you said 17 colours, but I wasn’t sure if you needed to buy 17 balls of yarn. For the hexagon blanket, I used two skeins of each color. Hope that helps! Hi! 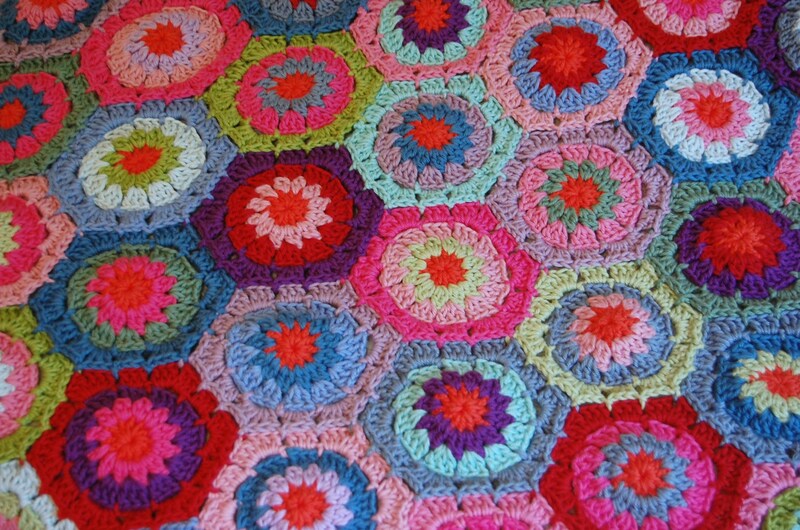 I am slightly obessed with your hexagon blanket I think, I love it! I am desperate to try but need to finish the baby blanket I’m on first (before the baby arrives!). My question though is how did you choose your colors? That’s intimidating to me. Thanks for the comment, Jen! It can be intimidating choosing the colors. I just lined up the proposed hues for a hexagon and see if it would ‘fit’ with the rest of the blanket. I do know there are people who have mapped out colors from the original blanket. It might be easier to follow a pattern than just wing it. I’m sure whatever you do it’ll turn out great!